The US trade deficit with its global partners fell to $49.3 billion in November, the first decline after five straight months of increases. Persistent concerns about US-Chinese trade and another potential government shutdown have investors seeking haven assets, and yields continue to dip lower as a result. In the US Treasury market, both the 10-year and 30-year yield were slightly lower for the week, finishing at 2.70% and 3.03% respectively. Tax-exempt municipal bonds also trended lower with the 10-year MMD down 3 basis points for the week and the 30-year MMD 4 basis points lower. Interest Rate Observations Source: Thomson Reuters, Bloomberg. 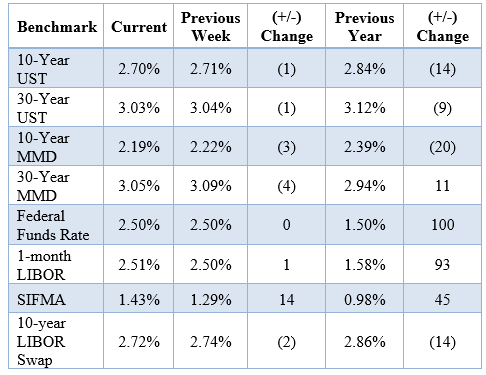 The table above reflects market conditions as of February 5, 2019.